Features recordings of Toccata e-moll for Clavier BWV 914 by Bach and original compositions for bayan by Ukrainian and Russian composers. Total time 54min.25sec. 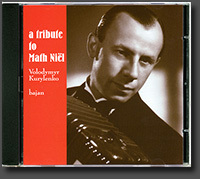 Jazzy compositions for bayan (accordion), waltzes and musettes, original and in arrangements by Western, Ukrainian and Russian composers. Total time 57min.03sec. ..: DEMO tracks from CD_3 :.. Features recordings of music by Mathieu Niël - a Dutch composer, piano player, whose 100th year of birth was widely celebrated in Maastricht, the Netherlands. ..: DEMO tracks from CD_4 :..
Music for real and imaginary movies. Features 18 soundtracks including "Femme Qui Passe", "When the Night Falls", "Sweet Loneliness" - own compositions by Volodymyr Kurylenko composed for different movies. Plus other pieces by other composers. 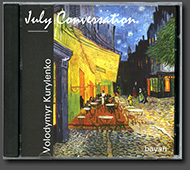 Features 17 soundtracks including "July Conversation", 3d movement from Jazz-Rock Partita for Bayan solo by Borys Myronchuk. 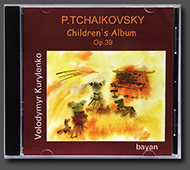 Plus other jazzy compositions for bayan (accordion), waltzes and musettes, original and in arrangements by Western, Ukrainian and Russian composers. 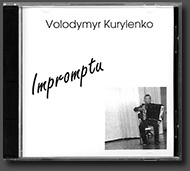 ..: DEMO tracks from CD_5 :..
CD 6: Volodymyr Kurylenko. 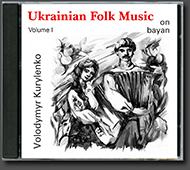 Ukrainian Folk Music on Bayan. Ukrainian Folk Song "Tykha voda" (*Silent Water). Ukrainian Folk Song "Ishly voly iz dibrovy" (*Oxes were coming from the oak woods). Ukrainian Folk Song "Ishov Kozak Potaykom" (*Cossack was going secretly). Polka - Ukrainian Folk Dance. Ukrainian Folk Song "Oy u vyshnevomu sadochku" (*Oh in a cherry garden). Ukrainian Folk Song "Oy z-za hory kamyanoyi" (*Oh from behind the stone mountaine). Ukrainian Folk Song "Divchyno moya, pereyaslavko" (*My girl from Pereyaslav). CD 7: Volodymyr Kurylenko. 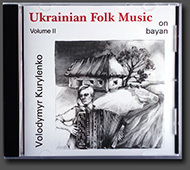 Ukrainian Folk Music on Bayan. Ukrainian Folk Song "Kopav, kopav krynychenku" (*Cossack was digging a well). Ukrainian Folk Song "Yakby meni ne tynochky" (*If there were no fences). Ukrainian Folk Song "Tam ponyzhe sela" (*There near the village). Total time: 30 min. 24 sec. 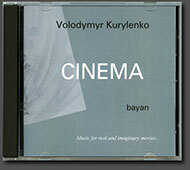 Listen to MP3 demo above on page amongst "Cinema" CD demos played on bayan by the author. 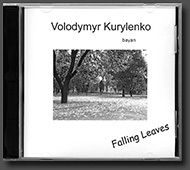 A song on lyrics by Olexandr Ryndya - Ukrainian poet, composer. If you are interested in future releases, content of CDs or you want to order CD, scores, please send an e-mail here: You will get the info of how to order the items you choose. * Prices are excluding delivery. * You will surely get a discount when buying 2 and more CDs!